We are able to offer you fully customized power cabinets for your requirements. The enclosures are provided with electrical equipment according to in-house designs or solutions developed by other design offices according to customers’ specifications. We also offer prefabricated products based on generally available enclosures supplied by other manufacturers. We deliver switchgear, control cabinets, cross-connection cabinets,wiring cabinets, metering cabinets, automatics cabinets and a complete range of power engineering structures for any application in line with our customer requirements. For our switchgear we manufacture input, coupling and outputbays with stationary and withdrawable circuit breakers, with knife switches and fuse switches (the latter offered in box andstrip versions), as well as horizontal and vertical terminal bays.We deliver output bays equipped with contactors and inverters. We build multipanel switchgear with guaranteed power supply, equipped with special systems (in relay and controller versions). The control cabinets equipped with controllers used for supervising manufacturing processes. We use controllers supplied by Siemens, GE Fanuc, Wago, Beckhoff, PhoenixContact and other types. We provide cabinets dedicated for power distribution purposes, which can be used in the following applications: cross-connection cabinets, wiring cabinets, control cabinets, lighting cabinets, battery cabinets, protection cabinets, telemechanics cabinets, central signalling system cabinets, metering cabinets, etc. We also offer telecommunication cabinets accommodating telecommunication equipment, provided with a power supply systems, ventilation, heating and signalling systems to notify access status, power supply and climatic conditions. The products are made using outdoor enclosures. 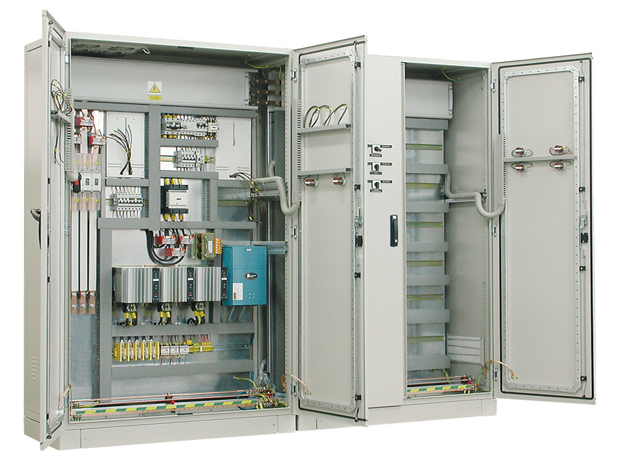 The enclosures are also used in the manufacture of wiring cabinets for electric power stations. As a result, the enclosures have a long operating life and optimum climatic conditions for electrical devices, which increases their efficiency and reliability. We offer equipment for power cabinets for all industries and various types of applications: from power distribution switchgear or wireless power supply solutions, through power supply to motor-driven consumers complete with production process automation, to control cabinets, signalling cabinets, wiring cabinets,etc., with traditional control systems or controllers, with visualisation of manufacturing/technological processes using mimic boards (by our own production) and screen displays. Inour power systems we use equipment offered by the majority of European manufacturers, depending on customer preferences, including Apator, ABB, Moeller, J. Müller, Legrand,Schneider, GE, Pokój, Phoenix Contact, Wago, Weidmüller, Dehn, Relpol, Finder and many more. We always make sure that our products are state-of-the-art,reliable and perfectly safe. As part of our ongoing commitment towards the client satisfaction, we are pleased to implement any solutions suggested by our Customers.